Ethan Makkai lives with his over-protective, putting it mildly, mother in a tiny apartment in Los Angeles. Ethan Makkai can also see ghosts. Something he and his mother work hard to keep a secret. For his fifteenth birthday, Ethan hopes his mother will let him walk to school without her for once. She refuses and he manages to sneak out and meet up with a friend. This reckless decision becomes the catalyst for Ethan's world turning upside down. As Ethan is getting into a fight with a school yard bully a man claiming to be his grandfather turns up. However, Ethan's mother has told him nothing of where she comes from or their family, and Ethan questions if the man is telling the truth. There is little time to argue when Ethan's mother calls and they hear her screaming. Rushing back to the apartment under attack from vicious birds they find the place ransacked and his mother missing. Ethan must trust the man to help him find his mother and the truth about his past and his future. Traveling to a hidden continent, Tara, Ethan learns his gift is not the curse he always thought but a means to save his mother and the people of Tara. I am always weary of portal fantasies (that's a whole other post). While this one does start predictably like most others, it is really the characters that made this book shine. Ethan is faced with seemingly impossible tasks, particularly since he only just learned about this other world, and yet he faces them all head-on and with witty asides. I often found myself smiling and laughing at Ethan's commentary as he adjusts to a new way of life. The story is a fast-paced adventure of rescue and intrigue where you can never be too certain where loyalties are held. Lewis smoothly blends elements of Celtic mythology into the world-building of Tara with just enough of a twist it warranted a fun dictionary at the back of the book. It was such an engaging read because of the strength of characters and I enjoyed getting to know them. In fact, because the main protagonists do start younger (teenager) I am pretty excited for the next installment to see how they continue to grow into their own. 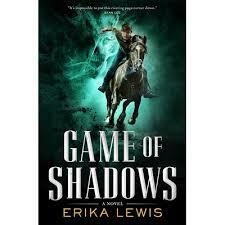 If you are looking for a fun, character-driven fantasy, you won't want to miss Game of Shadows. Nerd Coefficient: 8/10 "A great start to a new series!"